A Tale of Two Chairs. Arrived in San Francisco. Unusually hot but I didn't mind. Immediately joined up with friends who were heading to an auction at San Fran's famed Presidio. Cool. I'm in. Auction preview took place prior to my arrival. Missed it. Flying blind. Entire auction presentation was by PowerPoint. Actual items were in an off-site location. Couldn't get a peek. Flying totally blind. Was armed with a listing sheet with no pictures. 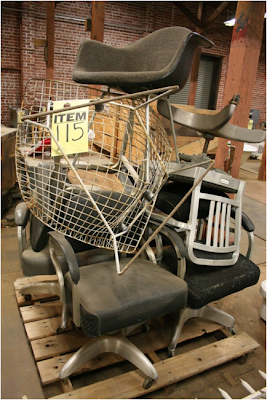 Lot #115 was labeled "stack of odd ball chairs". Intrigued. I dig odd ball chairs. Hopped on iPhone. Found website for the auction. Immediately recognized an Eames shell chair and what appeared to be a large Bertoia Diamond chair tossed on its hind side. Both were perched precariously atop a stack of vintage task chairs. I was certain a large Bertoia Diamond Chair in good condition pulls decent coin. This one showed a few signs of rust but not enough to frighten little 'ol DIY'n me. An Eames shell chair is classic and speaks for itself. There was an opportunity to score. Big time. Had no knowledge of condition or notion of how I would ship eight chairs. Details. Bidding on lot #115 began. Only two other bidders played. Moment of joy quickly overshadowed by realization that other bidders had likely attended the preview and were more aware of condition than I was. To further expand upon my joy wrapped in what-have-you-done? discomfort, I would have to wait four days before physically seeing my chairs. I could handle it. Put a call out to Atomic Indy's Facebook fan crew to I.D. the task chairs. Emeco and Goodform was the consensus. Aforementioned fan crew is good. Really good. Began estimating value based on perceived condition. Without having yet actually seen the chairs. Silly. Spent next several days creating a detailed guide to San Francisco's Mid Century Modern furniture stores. Enough eye candy to keep my mind occupied. Finally - time alone with a "stack of odd ball chairs" had come. Began dismantling the unique architecture a zip-tied stack of vintage chairs creates. Something seemed off about my Large Bertioa Diamond Chair. Not referring to the rust. Its oddity wasn't clear until it stood before me. Upright. Was face to face with a Bertoia Bird Chair. More rare and more valuable. Sweet. Eames chair was in great shape. No upholstery tears and all glides intact. Emeco and Goodform chairs existed in various states of disrepair. Not my thing. What to do? Craigslisted six Emeco/Goodform chairs as a unit. One day later sold them for 65% of auction winning price. Joyful emotions escalating. Now on to the matter of transport for two remaining chairs. Considered Greyhound Shipping. Size restrictions were unfavorable. Settled for Uship. Impeccable experience. Am now a Uship fan. It's like Ebay for your shipping needs except you take the low bidder with best feedback. Brilliant. Am now sitting upon a newly acquired Eames shell chair throne as I type. Contemplating the light welding and restorative efforts required to bring our new Bird Chair to life. Some future post is sure to detail said Bird Chair restoration. Ok, fab story and what a score. Must thank you for the heads up on uship... in desperate need of a reliable shipper. This is what I hope will happen to me someday! 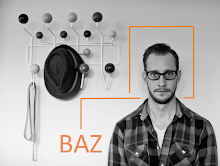 You rock Baz. This is outstanding. I recently saw two smaller chairs similar to the bird at a local vintage store. The store said they were reproductions, but were still selling them for upwards of $200 apiece. go you! such a good story that you'll be able to tell forever (one of my favorite things about buying vintage). oops... had a little trouble with the comment windows. Sorry. Great Bird Chair! there was one just like it (but with a cover) in the Monsanto House of the Future. Glad to hear you had a good experience on uShip. We also have a lot of Special Care transporters should you need to send more delicate pieces in the future (http://www.uship.com/specialcare/). Let me know if you have any questions or comments about the site that you would like answered. Good luck with the Bird Chair restoration, looks like a fantastic find! Fantastic score! Would love to see how you restore the bird chair. Love your blog, can't wait to read more. Great to know someone who has used uship. Perhaps I won't be scared off from shipping anything larger than side shells anymore!